Here's one of the new online slots games. It’s hard to imagine any setting more tranquil and exquisite than a Japanese cherry blossom orchard. In Okinawa, the trees begin to break into blossom in the month of January, creating a beautiful sea of white and pink as far as the eye can see. Cherry blossoms can symbolise the fleeting nature of life, because of their temporary beauty, and also the cycle of life, because of the recurrence of the blooms each year. 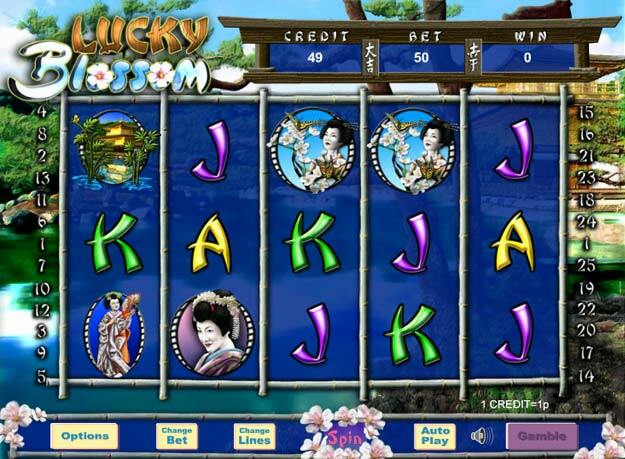 Step into the glorious garden of Lucky Blossom recent online slot games, and experience the zen atmosphere, watch the reels flit by, and wait for the wins to fall like blossoms for you to catch and keep. An Eyecon game is guaranteed to feature stunning graphics, consistent and interesting imagery, and a reliable set of classic bonus features that fit seamlessly with the theme and enhance the gameplay. WILDS – Fan symbols substitute for all other symbols except SCATTERS. When a fan substitutes in a win, prizes are doubled. These can garner large wins of up to 9,500 coins, making them a valuable symbol. SCATTERS – 3 or more SCATTERED Sakura Blossom symbols trigger 15 Free Spins with tripled prizes. Free Spins are at the bet and lines of the triggering spin, and can be retriggered. GAMBLE – gamble your wins, with the chance to double them. The background music is relaxing, and adds to the tranquil atmosphere of the game. And if you want to experience even more relaxation, you can set a number of Autospins, sit back, and meditate as you watch the symbols spin by. There are handy buttons to customise your bet and paylines, giving you a great amount of control over your game. This game’s theme and setting are so tranquil they’re sure to relax you, but its exciting bonus features and chance for large payouts means you’ll never be bored. It’s a potentially bountiful beauty of a slots title.